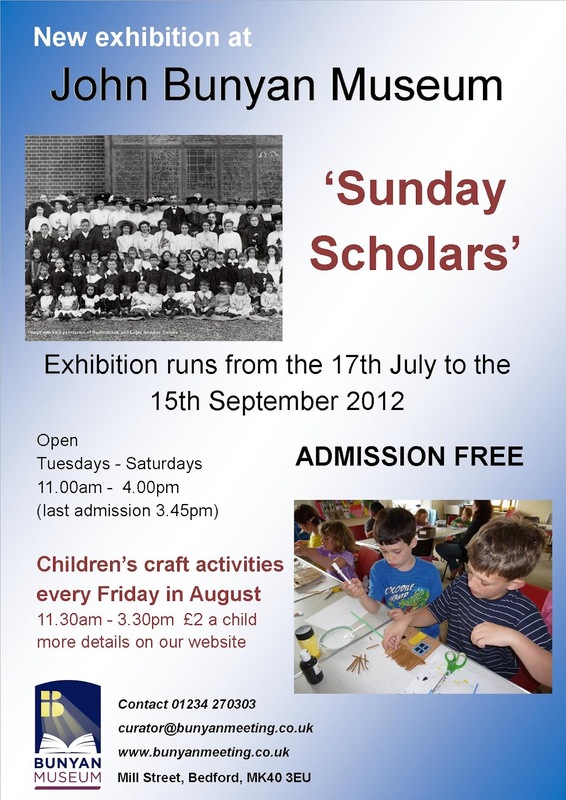 As with many exhibitions, the idea for ‘Sunday Scholars’ came from discovering a “forgotten” item in the store. 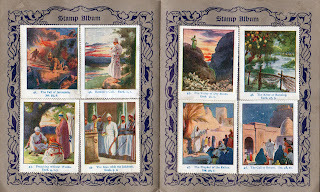 Last year I came across a handful of Sunday school stamp books. They had belonged to Lillian Whiting who had attended Bunyan Meeting Sunday School during the 1920s. 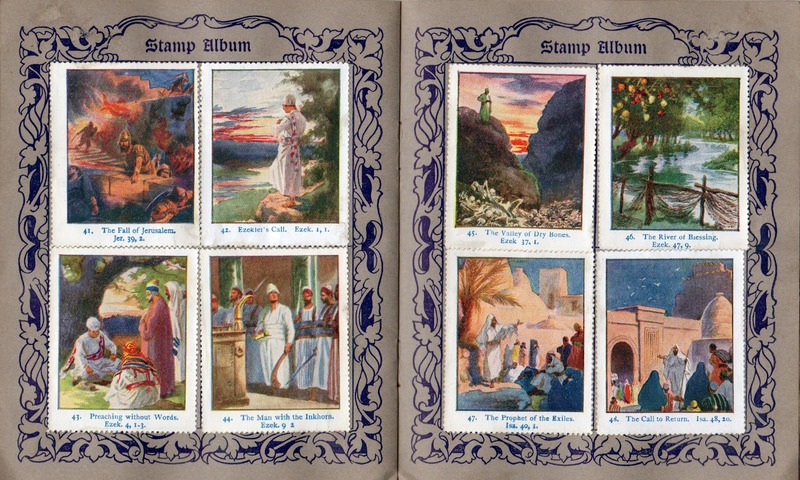 The stamps were given out each week to the children to mark their attendance. 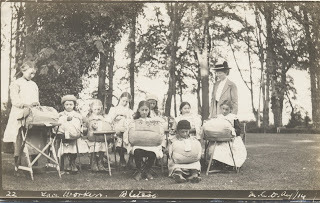 At the end of the year (or sometimes the quarter) children would get prizes and rewards for good attendance. With my exhibition hat always on, I thought that Sunday schools would be an interesting theme, allowing the link with Bunyan Meeting church to be explored and possibly linking with the wider community. 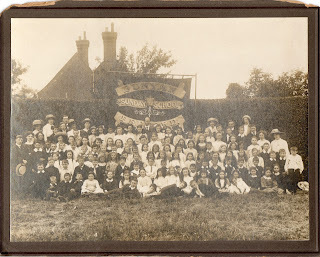 What I didn’t realise at the time was how potentially large a subject the history of Sundays schools was, and the many directions which could be followed. I had to remember that I have only a fairly small exhibition space and I had to keep a tight focus. I felt that the most interesting aspect to explore in the exhibition was the vital role that Sunday Schools played in helping the poor working majority of people in this country to learn to read. This is a story of national importance, now largely forgotten, which, I discovered also has strong local connections. For instance the local lace-making schools, set up to teach reading and lace-making, relied heavily on the Sunday schools to teach reading and writing. Lydia at the Higgins who discovered this fact through her own research was able to loan us a bobbin used in lace making with ‘John Bunyan’ written on it. Through research we found that Bunyan Meeting and its Sunday schools, also linked to The Higgins, as Bunyan Meeting used part of what is now the Bedford Gallery for its Sunday school between 1848 -1867. That Bunyan Meeting’s large hall (now used for badminton club and Wednesday lunches) was made specially to house the huge number of children attending the Sunday school (approx. 400 children!). I also discovered a reference to the first school mistress at Bunyan Meeting Mary Woodward, that on her grave it reads - “This worthy woman founded Bunyan Sunday School. Robert Raikes was her guest”. Robert Raikes was the founder of the Sunday school movement. After a bit of searching in the flower beds in the church garden, I found the grave now tucked behind a tree and only just legible. "My grandparents were caretakers at a large Victorian Baptist church in Yorkshire. During the war when my father was away weekends would be spent at my grandparents, so from the age of three Sunday School was a part of my life. I can remember a table sand tray and singing, Jesus wants me for a sunbeam and hear the pennies dropping. Later anniversaries in new frock and outing by train to Southport." If you have any memories of Sunday Schools, it would be great to hear them and share them too! You can see John Bunyan's Bobbin, a school slate, Robert Raikes commemorative Sunday Schools medal and a tea ticket from a Sunday School Meeting at Elstow, all from The Higgins collection, on display as part of the Sunday Scholars exhibition at John Bunyan Museum. The exhibition is open until the 15th September 2012, during the normal museum opening times – Tuesday to Saturday, 11am to 4pm. There are lots of family friendly activities, including the chance to draw your own animal to join our ‘Noah’s Ark’, and every Friday in August we have a fun programme of children’s craft activities. www.bunyanmeeting.co.uk/museum .